And very exciting it was too for avid fans, myself included, as it was announced that a series of on-stage shows will take place at Glasgow’s Hydro in the latter half of 2014. 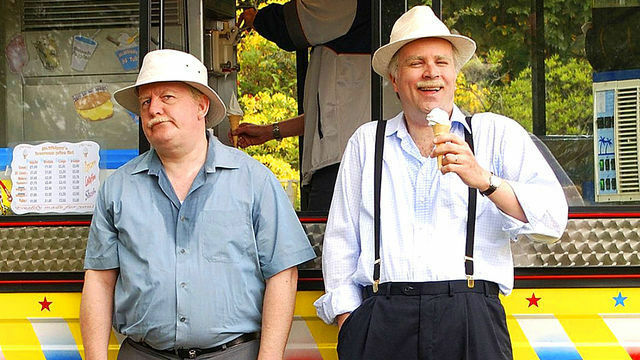 The pair also say they are in talks with the BBC, about reawakening the sitcom for TV. Also present at the press conference were Jane McCarry (Isa), Sanjeev Kohli (Navid), Gavin Mitchell (Boaby), Mark Cox (Tam) and Paul Riley (Winston). The plans will see all five reunited with Jack and Victor, for shows spread over six days and nights, beginning September 30th next year. The double-act went their separate ways in 2008, due to what was said to be ‘creative differences’. Others speculate that the two split after a row over the running of their production company Effingee. At the recent press conference Kiernan told BBC Scotland, “We’d done 10 years together. The two of us had been together longer than the Beatles and we were frazzled.” The pair however laughed off questions concerning who had been the first to suggest they “kiss and make up”, and insisted the differences have been resolved. Still Game originated as a stage show for the Edinburgh Fringe Festival in 1997 surrounding the characters of Jack, Victor & Winston, before becoming a hit BBC sitcom in 2002. The sketch ran for 5 years, winning several Scottish BAFTA awards, with the final episode airing in 2007. But despite the six year departure, support for the show has remained as strong as ever. One of multiple Facebook campaigns to ‘Bring back Still Game’, reached over 66,000 likes on the social media site. “I think we owe them a big thank you for being so patient with us.” says Hemphill. Greg and Ford seemed to sum up the whole morale of the show whilst joking with each other during an interview at the press conference: “It’ll be a laugh, it’ll be a laugh.” And indeed the duo have never failed to make us chuckle over the years, so let’s hope there are many more moments of ‘bar banter’ and ‘bogus gasmen’ to come. Posted in Arts and tagged comedy, television. Bookmark the permalink.